Easily track your customer service requests. NewWaySERVICE allows you to track and manage your work orders no matter your business sector. With NewWaySERVICE, you can manage any types of requests such as repairs, maintenance, support and information. NewWaySERVICE is accessible from anywhere, anytime since it is a cloud Web application which means that you or your technicians can update work orders from a desktop computer, a tablet or even a smartphone. NewWaySERVICE is always available, 24 hours a day, 7 days a week. You have nothing to install on your end. A simple internet connection is all you need to use NewWaySERVICE. NewWaySERVICE allows you to set up work schedule for each of your technicians. When creating a work order, an appointment will be automatically created according to your technician's work schedule. You can also use the calendar of appointments to move or edit appointments as needed. Our service management application also allows you to track all of your equipment. By assigning a unique serial number to each piece of equipment, you can easily keep track of work performed on all of your equipment. 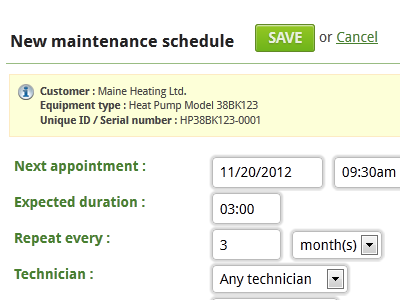 You can also easily manage your recurring tasks by creating maintenance schedules for each piece of equipment. For example, if certain equipment requires routine maintenance every 3 months, you can create a maintenance schedule and NewWaySERVICE will automatically generate a work order for the equipment every 3 months. No more paper! 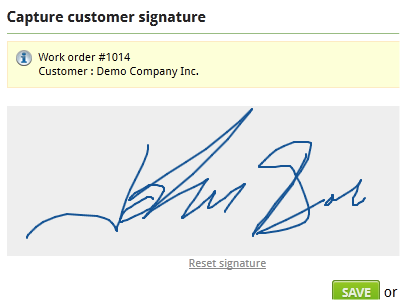 NewWaySERVICE allows you to capture your customers' signatures. 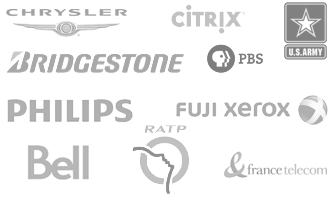 Your customers can sign directly on your smartphone or tablet’s touch-screen or by using your computer’s mouse. Inventory and multi-warehouse feature: NewWaySERVICE automatically adjusts your inventory when your technicians use parts on work orders. You can assign a default warehouse (such as a truck or van) to each technician to indicate from which warehouse parts used should be decreased by default. Limited access to data for your subcontractors: If you have subcontractors that work for your business, NewWaySERVICE allows you to limit data they can access. For example, you can provide access only to their work orders or customers. Customer portal: By activating the customer portal, you can allow your customers to create work orders directly by filling out an online form that you can configure according to your needs. E-mail notifications: Automatically send an e-mail when a specific status for a work order remains unchanged for a designated period of time. This is very useful for high priority work orders. Notifications can also be set to automatically send e-mails when equipment warranties or service contracts are about to expire. You can also use notifications to automatically send an e-mail when the status of a work order has changed. For example, you might want to send an e-mail automatically to your customer when a work order has been marked as completed. Attach documents: You can attach documents such as PDF files and images, to work orders and customer files, for example. Most NewWaySERVICE modules allow you to attach documents. Knowledge base: This option is useful to store information (in the form of articles) that your technicians can consult as needed. This option can also be used to store information (such as procedures) that you can send to your customers. API (Application Programming Interface): The API is a programming interface that allows you to exchange data between NewWaySERVICE and other software. Once you've created your account, just follow a few simple steps on screen to start using NewWaySERVICE immediately. After entering your company address and uploading your logo, you can create your first work order. You can also print your work order by choosing from the models already included in the software. If needed, we offer customization services for work order or report models. NewWaySERVICE can also be customized according to your needs. Don't like the terms "work order" or "customer"? Just change them via the Terminology option. Do you require an additional field to store data that's specific to your business? No problem! 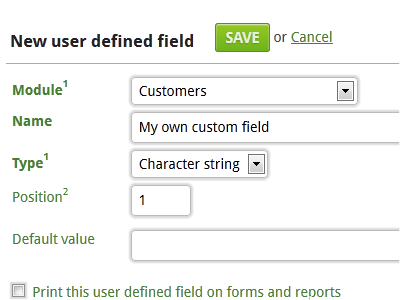 With NewWaySERVICE, you can easily create customized fields. NewWaySERVICE also allows you to create an unlimited number of user defined fields so that you can enter and store information required by your organization. $24.48 USD per technician per month or less! You only have to pay for technicians who need to have work orders assigned to them. You do not have to pay for dispatchers or administrative staff who access the application and do not need to be assigned to work orders. Access to the customer portal is also free for your customers. Get an instant rebate depending on the number of technicians in your subscription: We offer a 5% rebate starting at 3 technicians, up to a 20% rebate for 50 technicians or more. Log in to your account and access the option "Subscription management" for a price simulation according to the number of technicians you need. See below for subscription pricing per technician per month in other currencies according to current exchange rates. These prices are for reference purposes only. There are no restrictions during your free trial period. NO. The trial period is free. If you want to continue to use NewWaySERVICE beyond the trial period, then you will need to subscribe. What's included with the subscription? Everything is included. There are no hidden fees. With a subscription, you can use and access NewWaySERVICE from anywhere, anytime. Only a Web browser and an Internet connection are required to access the application. Free and courteous technical support is also included. No additional service contracts must be purchased. 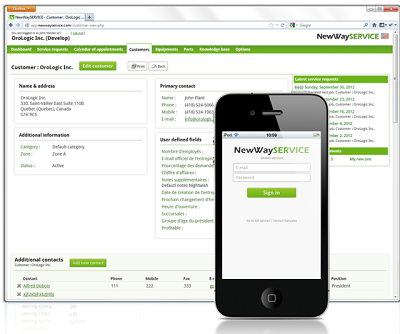 NewWaySERVICE is a cloud Web application offered as a SaaS model. The application was developed and is managed by OroLogic Inc. Established in 1996, OroLogic Inc. is a Canadian company specialized in developing management software. We offer only top-quality products to ensure our customers’ complete satisfaction. NewWaySERVICE is the perfect solution for service departments, repair shops and technicians working in the field. Over the years, NewWaySERVICE has also proven to be a top choice for facilities management, building maintenance, fleet management, equipment maintenance, property management, IT management and more. NewWaySERVICE is a service request management application.